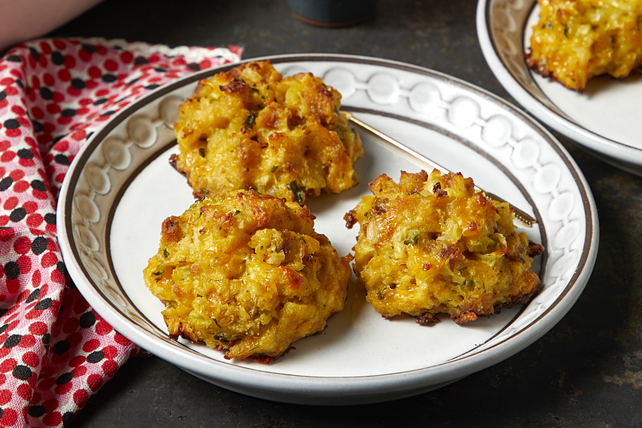 Remind them that great things come in small packages when you make these STOVE TOP Cauliflower Bites! Dress these tasty cauliflower bites in cheddar cheese and stuffing mix for a satisfying side dish. Add hot water and margarine to stuffing mix in large bowl; stir just until moistened. Roll into 30 (2-inch) balls. Bake 18 to 20 min. or until heated through and lightly browned. Prepare using your favourite frozen riced cauliflower medley. Drink plenty of water before meals or parties to help curb your appetite and better manage food choices and portions. Prepare recipe as directed; cool completely. Place in freezer-weight resealable plastic bags; freeze up to 3 months. When ready to serve, thaw in refrigerator. Place on baking sheets and bake in 400°F oven 10 to 15 min. or until heated through.